Delivers strong immune support with transfer factors from cow colostrum and chicken egg yolk sources. Shown in independent studies to increase immune cell activity by 283 percent. Comes in a great-tasting citrus-cream flavored chewable tablet. Receive the advanced immune support of Transfer Factor Tri-Factor in a convenient, great-tasting chewable tablet! 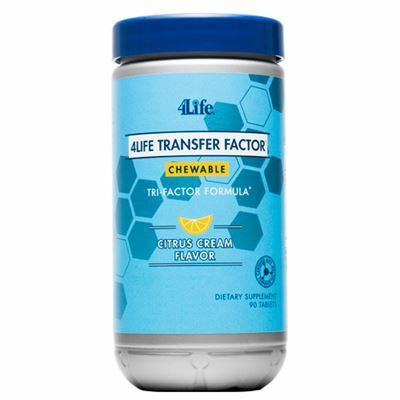 No matter where you’re going or what you’re doing, easily take your 4Life Transfer Factor Chewable with you and enjoy the same immune-boosting benefits of 4Life Transfer Factor Tri-factor formula. Ideal for people on-the-go and who don’t want to swallow pills. Transfer factors are tiny messenger molecules that transfer immunity information from one entity to another, such as between a mother and her breastfeeding infant. Contains our exclusive Transfer Factor Tri-Factor Nanofactor, combining the power and strength of transfer factors from cow colostrum and egg yolks for the broadest spectrum of immune support available. The extraction processes for transfer factors from colostrum and egg sources are protected by US patents 4,816,563 (cow colostrum) 6,468,534 (egg yolks), and 6,866,868 (exclusive manufacturing techniques), with other patents pending. Unlike other immune ingredients that simply boost the immune system, 4Life Transfer Factor Chewable tailors its approach to what your body needs—boosting or balancing. Independent laboratory studies show that 4Life Transfer Factor E-XF boosts immune system effectiveness by raising Natural Killer cell function an impressive 283 percent. Natural Killer cells are on the front lines of your immune system. 4Life Transfer Factor products are featured in the Physicians' Desk Reference For Nonprescription Drugs and Dietary Supplements since 2003, the standard supplement guide for physicians that can be found in virtually every physician's office, hospital, and pharmacy in the United States. 4Life Transfer Factor products have been recommended by the Russian Federation for use as immune modulators in hospitals and clinics. The first dietary supplements to be recommended in this manner, this historic announcement was a result of ten separate clinical trials and two experimental studies extolling the benefits of 4Life Transfer Factor products.